In several of these posts highlighting the chain of direct and indirect benefits that PrinterLogic brings, we've mentioned how eliminating print servers also helps to eliminate single points of failure. That translates to increased printer availability and more printer uptime throughout your organization—and fewer calls to the service desk as a welcome bonus. As you probably already know, though, most printer-related calls to the service desk aren't complaints about a particular printer being unavailable. They actually have to do with employees not being able to install the printers in the first place. Traditional print management solutions certainly don't make this easy. Even tech-savvy computer users regularly run into trouble with printer installation, especially in remote situations. PrinterLogic's Self-Installation Portal addresses this longstanding shortcoming of enterprise printing by empowering your end users and simplifying the printer installation process for employees as well as admins. And that's true no matter how many sites or employees your organization has. As a matter of fact, this is where the simplicity and scalability of PrinterLogic truly shine. Suddenly, no more manual installs. The Self-Installation Portal allows employees to conveniently browse available printers, select the closest one, and then automatically install that printer with a single click—an intuitive, uniform, and secure experience no matter where they happen to be. Enterprise printing suddenly becomes about as complex as visiting a website. 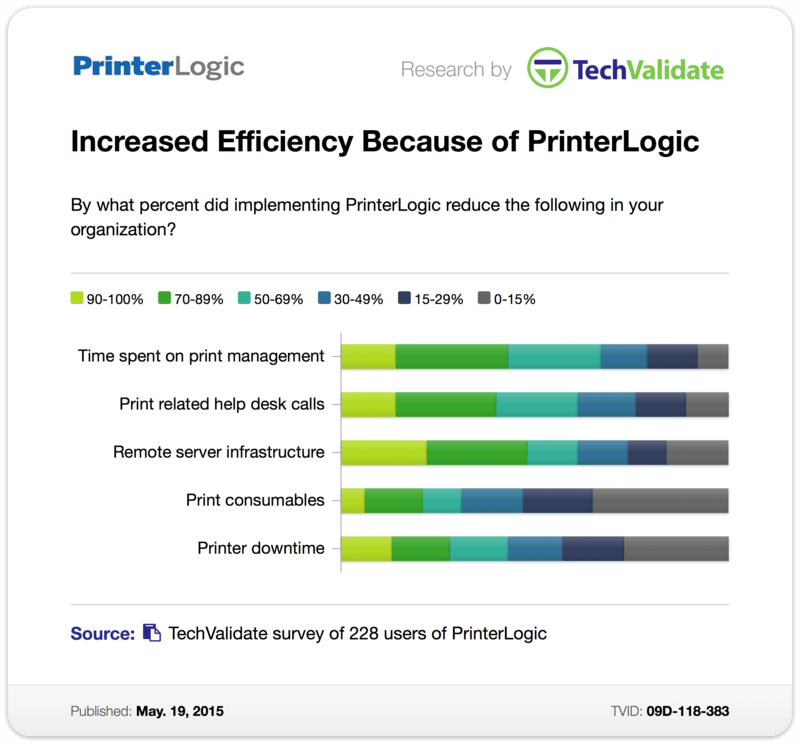 With that kind of ease of use, it's no wonder why a recent TechValidate survey of PrinterLogic's enterprise customers revealed that 77% of them saw at least a 30% reduction in service desk calls. More impressive still is that 62% of those customers saw a reduction in service desk calls by more than 50%. Even better: 41% saw a reduction of greater than 70%, while 15% saw a reduction of more than 90%. Imagine that—a 90% reduction in service desk calls! Just think of the time and cost savings you'd achieve with even as little as a 10% or 20% reduction. And those almost unbelievable stats are affirmed real-world results after these organizations deployed PrinterLogic as their enterprise printing solution. BankPlus said service desk calls were "skyrocketing" before PrinterLogic. Now everything is centrally managed and they're on track for "impressive" ROI. Zeus Industrial Products was seeing daily printer outages and was fielding tons of service desk calls as a result. After PrinterLogic? "Printer issues are simply gone now." GH Metal Solutions employees used to have call support every time they wanted to install a printer. Today, thanks to PrinterLogic, they can do it themselves enterprise-wide. As Vice President of Marketing for PrinterLogic, it's my privilege to share our Eliminate Print Servers message through our marketing channels. We recently engaged TechValidate to survey our customers. The results were staggering: Almost 100% would recommend PrinterLogic; ROI over 100% for 88% of our customers; 99% report ease of use as great or better; 84% installed our solution in less than 10 days; and much more. Over the coming weeks and months, I will be sharing more results from the survey through our blog. I hope you enjoy the information. Don't hesitate to comment or contact us if you have any questions.